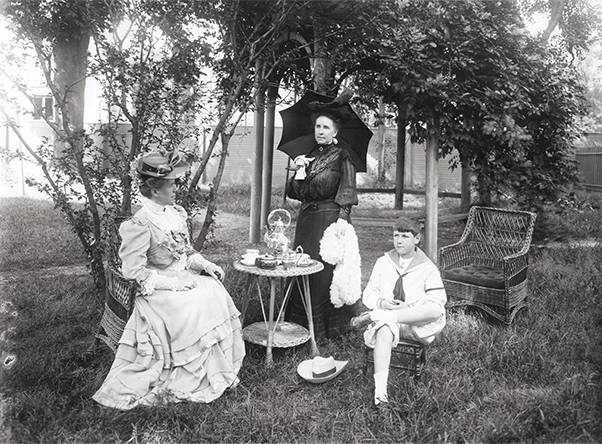 Afternoon tea on the back lawn of the Boudinot mansion during the 19th century. The last time you stood in the middle of the PSE&G Plaza at Broad Street and Raymond Boulevard on the site of the old PSE&G Terminal building, you may have seen a large vertical marker pointing to important downtown sites. On the column is a bronze tablet commemorating the home of Newark's well-known Boudinot family. While our only tie to the Boudinots is this bronze signpost, it is an important one. Unlike other prominent Newark families, the Boudinots were not of English descent. They were fourth generation Huguenots whose ancestors had fled France to settle in the new world following the Edict of Nantes in 1598. The best known member of this generation is Elisha Boudinot of Elizabeth. He was born in Burlington in 1740, and his service in various capacities during the Revolutionary War and as director of the United States Mint earned him national significance. After Elisha's death the property was sold to Isaac Meeker who lived there until 1850 when he moved to New York. The building served as a girl's school for the next five years, and at that time it became the home of Stephen Hays Condict, who made it his residence until his death in 1895. In 1912 the building was demolished, and it was replaced by the PSE&G Terminal Building. From colonial mansion, to transportation terminal, to headquarters office, this site has been a pivotal point in downtown Newark.